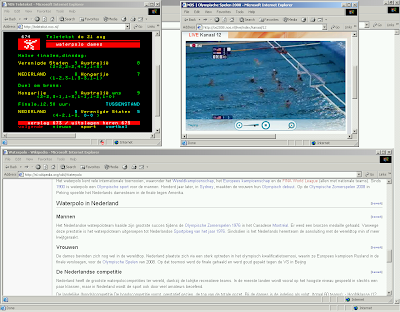 Right now, (it’s Thursday 21 Aug, 2008, 13:37 CET), the ladies are playing the water polo final at the Beijing Olympics. The Netherlands are playing the United States. You can see it live at http://os2008.nos.nl/. Apparently, the Dutch have already won! 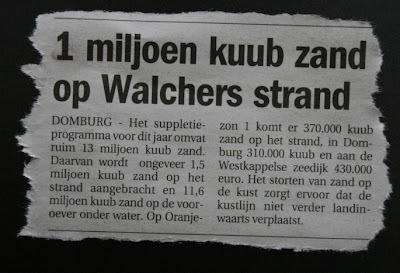 I’d sure like to be there when they start dumping 430.000 euros on the sea dyke in Westkapelle! Do you know how “Netherlands” should be pronounced? You may think you do, but maybe you should check out Merriam-Webster’s Online Dictionary, just to be sure! A friend of mine pointed me to this website, The Daily WTF, Curious Perversions in Information Technology. On this website you can get your daily dose of funny, stupid or weird bits of programming code. How about this bit of code for converting a byte array to hexadecimal? Here’s another nice example of the use of constants, to make SQL query building much easier! Found on Slashdot: End User License Gems. There’s an article about statements in End User License Agreements – you know, the things you should actually read before you click “I agree”. Some companies really want you to agree to the most insane statements. I seriously think that some of these are, in fact, against the law. This afternoon, we got a nice little package in the mail. Because we ordered ADSL a few weeks ago, we received a free MP3 player. Nothing special, some unknown brand, but still a very nice, 256 MB MP3 player. This is the reason I don’t use MSN Messenger! Read through the comments of this blog entry (in Dutch)… Are these people for real?!? After Google Maps and Google Earth, Google today introduced Google Moon. Don’t forget to check out the highest detail images! Did you know you could create your own stamps? At TPG Post, you can have you own picture be printed as a real stamp.